2. 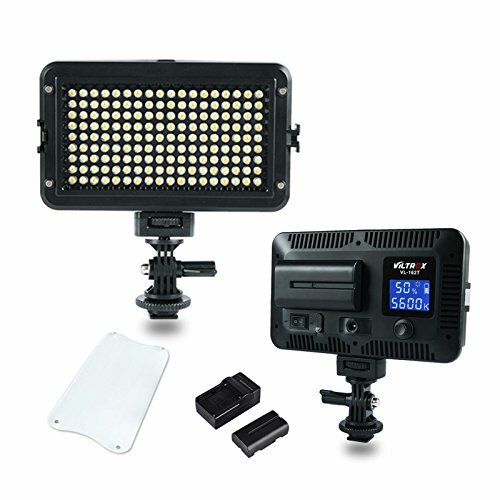 It has high brightness,nature and soft lights, stable color temperature. 3. The high definition LCD display let the operation interface is clear. 4. You can adjust the brightness and color temperature steplessly. 5. It's suitable for portrait, children, wedding etc. Bi-Color & 12W High Brightness. 3300K-5600K color temperature , 20%-100% Dimmable brightness .Meet most needs for photography fill-in light. Come with NP-F550 battery and charger ,also support AC adapter (not include), that's more humane and convenient than other brand light at similar price . 6.6x3.9 inch portable size, only 230g, you can carry it anywhere .Easy to fill light at any time .also works nice for Micro-camera . With LCD display.makes operration interface much clear, you can see the battery remaining,color temperature,brightness range. Manufacturer: Shenzhen Jueying Technology Co., Ltd. Publisher: Shenzhen Jueying Technology Co., Ltd. Studio: Shenzhen Jueying Technology Co., Ltd. If you have any questions about this product by VILTROX, contact us by completing and submitting the form below. If you are looking for a specif part number, please include it with your message.